A report from the Woburn Reporter of June 24th, 1911. Most of the front page was taken up with the following report. Further in, it mentions that next weeks paper will feature photos of the celebrations, but alas, I have yet to find that weeks copy! This event, the like of which many of us may never see again, has come and gone. The weeks of planning, scheming, collecting to secure the best and fullest result, have given place to a time, when we can look back, note the points which might have been improved and rejoice at the success and plea­sure that were achieved. Of the former this is not the place to speak now. Of the latter we cannot find words adequate to express the appreciation felt at the smooth working, the general success and the high tone of the whole day’s proceedings. It was indeed a red letter day for the Sands, and one over which the youngsters in years to come will be able to crony together as life’s vale approaches. It was a right royal day, and every one will echo the sentiment it bespoke, “Long Live the King” – and Queen. The preliminary gatherings resulted in a Committee being appointed – designated latterly, the Executive – comprising the Rev. D. W. Henry (chairman), Mrs. Spinney, Mrs. Pettit, Miss Crewdson, the Rev. H. Stratton, Messrs. Pettit, H. Barker, H. Giles, J. Pikesley, jun., F. Wingrave, E. G. Miller, J. McMurtrie, and Mould, with Mr. Cheetham (Hon. Sec.) and Mr Plater (treasurer). They arranged for a division of duties and sub-committees instituted under the following officers: Tea, Mr. A. W. Pettit (chairman), Mr. Wingrave (Hon, sec.) Sports, Mr. E. G. Miller (chairman), Mr. J. Pikesley, jun. (Hon. sec. ); Pageant, Miss Crewdson (chairman), Mr. McMurtrie (Hon. sec), with their various bands of helpers, each threw the utmost energy into the work, and, as distinctions are lively to be invidious, while no one section made the day, we feel it is only just to give to one and all the utmost praise for their ser­vices, and the splendid result that was achieved. The endeavours of the decorative section were first noticeable. Having the poles draped and flagged and in position a week on Thursday, they set to work in earnest early on Monday morning to connect them lengthwise and cross-wise with bannerettes on strings. Next came the triumphal arch just below the school on Woburn Hill, and here the evergreen clothing was surmounted with flags, and from side to side were stretched, “God save our Queen” facing the village, and “God save the King” facing the hill. A similar arch was later erected at a point just below Russell street, and practically on the brow of the rise from the station. The mottoes here were “God save the King” looking to the village, and “God bless our Queen” facing the station. The draped poles en route were garlanded with wreaths of evergreens enclosing “G.R.”, they were also based with evergreen, and as a whole the appearance was most creditable; in fact, viewed from a distance, it was quite pretty, and the additions made by residents privately, enhanced the general charm. Consider­ing the material to hand, and the time at the disposal of the voluntary helpers, the results were far better than might have been expected; the gala idea was at once stamped on the proceedings, and its spirit was insured from the first, if the weather was only propitious. The early part of the week cast doubts upon it. Rain on Monday was followed by swiftly chasing clouds, and slight showers on Tuesday; a more or less overcast and sultry Wednesday, a very threatening evening, and a general prospect none too bright for the day. This, however, did not damp the ardour of many, and the hours from tea time till dark were filled in by busy fingers in all directions until the majority of the establishments in the main street were bedecked with a greater or less profusion of flags and other items of the decorative art. Mr. Bailey of the Railway Hotel, erected a triumphal arch on his own account, and it was a distinct addition, both in workmanship and design up the others. 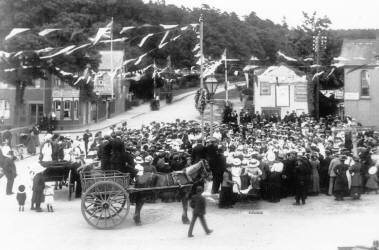 Mr. Voss Clarke set out the waiting-room at the station with coloured chains etc., and outside hung flags. Mr Hardy (Messrs Benskins) set out his windows and wares in the national colours, and gilt “G.R.”, he further festooned the outside in similar colours and fairy lamps, and in the centre a gas star gave a setting to the whole; the archway to the yard was ever-greened, and the pillars supported, and small barrels in red, white and blue. Fairy lamps and the national colours bedecked the Swan and Fir Tree Hotels; the shop and front of Messr. Wooding and Edgington were set out with various coloured adornments, well-balanced and blended, and Mr. Dudley’s house and gardens in Station Road were strung from point to point with tricoloured festoons, bannerettes, etc., and across the face of the house was picked out “God Bless the Queen.” “God save the King.” Stoke Albany, the residence of Mr. Cheetham, was another worthy of mention for neat display, and Mr. Moulds, and Mr. Mountforts, standing side by side, for their very effective use of the national and other colours over houses and tree, in festoon and other designs. At Aspley Heath, Miss Baker’s was one of the best and most profusely adorned, Mrs. Gaskin’s, on Hardwicke Hill, was exceedingly pretty, and many others in various directions are to be thanked and congratulated, though too numerous to mention. Returning to the shops, Mr. McMurtrie’s festoons, drapery, “G.R.” fairy lamps, and other additions were well arranged, and the “Co-op.” was neat in design and well lamped. Mr. Toogood’s and others near, made one long picture, his being the centre piece with col­oured balls, flags, and bunting, the Post Office was draped in evergreen, Mr. Moore’s was beflagged, evergreened, etc., and Mr. Inwood’s was pillared with coloured rosettes, beflagged. bailed and draped in a most effec­tive manner. Considering all things the Sands can shake hands with themselves; they decorated well, and it has been spoken of as “the best decorated village” for many miles. Thursday opened dull and threatening. A glimpse now and again of the sun only served to accentuate these appearance, but a strong breeze sprang up, and though as evening drew on it was chilly, yet during the day it served the double purpose of making the air fresh and pleasant, and driving the water laden clouds beyond the Sands. As a day of much motion and sport, it was thus more enjoyable than the brilliance and heat of the sun, and, though fears were expressed by many, nothing but a spray of drops was experienced from beginning to finish, and no doubt this greatly aided in the carrying to an end of what is spoken of as the best holiday ever had in the memory of those who have known the place for many years. 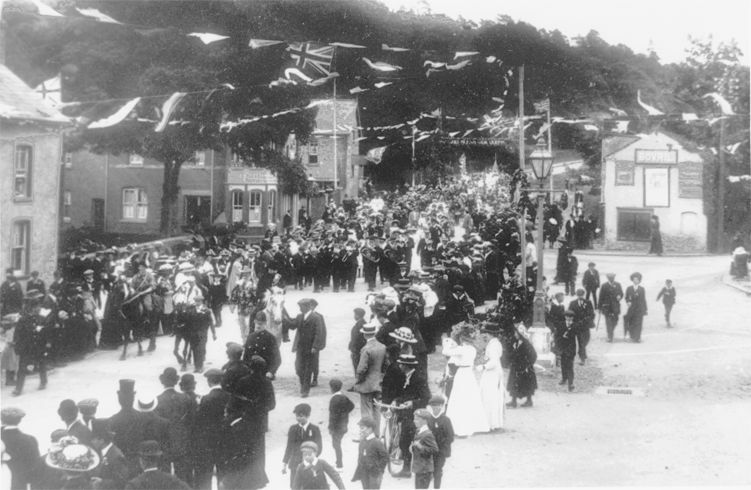 The first item, or rather double event, of the day’s programme, was the service in the Church at 9.30 and the assembling at the same hour of the children at the School to receive their medals preparatory to processioning to the Market Square, where they were to sing patriotic songs and the National Anthem. The service was conducted by the Rev. D. W. Henry it was well attended and the form was a shortened one of that approved by the Archbishops of Canterbury and York. It was made as wide in spirit as circumstances would permit, and the les­son from St. Peter 2. v.11-17, was read by the Rev. C. F. Brend, the resident Wesleyan Minister. The prayers were monotoned by the Rev. Basil Brown. The music was capably rendered by the choir and the organ was efficiently played at by Mr. Seabrook, the congregation most heartily joining in the processional “O God, our help” and the hymn “Now thank we all our God” before the lesson. The Te Deum proceeded the blessing and then came the National Anthem sung with a verse that not only fittingly concluded the service, but inspirited all hearing or taking part for the remainder of the day. Directly on leaving the sacred edifice, the way was made to the Square. Headed by the local band, under Mr. H. Giles, stepping to the quick march “Loyal Hearts,” and marshalled by their teachers, the scholars marched down, each jauntily carrying a flag, and bearing on their breasts the newly-pinned-on medals. Formed up into horse-shoe-shape, and conducted by Mr. Swain, they sang, to the delight of all, and with the highest credit to themselves and their teachers. “Britannia, the pride of the Ocean,” “Now pray we for our country,” and “Hurrah! for England,” and “Britons never shall be slaves”. Their sweet voices blended well in three two-part songs, the waving of their flags made a picture striking and gay and the appreciation of the large gathering was emphatic. The Band led the National Anthem, and then headed the procession to the field for the juvenile sports. 150 yards flat, boys over 12 and under 16: 1 W. Wooding 2 W. J. Blackaby, 3 Walter Smith. 100 yards flat, girls under 12: 1 C. Clare, 2 N. Simmonds, 3 A. 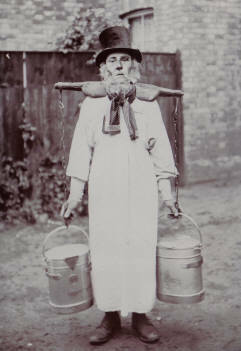 Farmer. 100 yards three-legged boys under 16: 1 C. Mould and W. Chibnall, 2 W. Wooding and A. Whiting, 3 L. Barden and C. Dudley. 50 yards flat, boys over 5 and under 8: 1 E. Kershaw, 2 A. Leadbeater, 3 F. Cox. 50 yards flat, girls’ over 5 and under 8: 1 P. Farmer, 2 M. Cross 3 S. Higgins. 120 yards, flat girls over 12 and under 16: 1 O. Jones 2 E. Norman 3 D. Sidford. 100 yards, flat boys over 8 and under 12: 1 P. Tew 2 W. Clarice 3 F. Williams. 100 yards egg and spoon, girls: 1 Hilda Kershaw 2 O. Jones 3 P. Prosser. 100 yards sack, boys under 16: 1 W. J. Blackaby 2 R. Smith 3 T. Mann. 100 yards skipping, girls under 14: 1 E. Norman, 2 N Simmonds, 3 L. Palmer. Lemon race: 1 F. Higgins 2 R Wooding 3 Harry Homans. Mounted rider (judges. Mr. Toogood, Miss Linnell and Mrs.Chester) 1 C. Inwood (Cowboy) 2 J. Piksley jun. (Hussar). Ladies Bicycles (judges, the Rev. D. W. Henry, Miss Allen and Mr. F. Mason) 1 Miss G. Brown. 2 Miss Toogood. Gents. bicycles 2 Gordon Tyers. Ladies Fancy Costumes (judges Mrs. de Mowbray, Mrs. Henry and Mr Pettit) 1 Miss Mary Page (Witch), 2 Miss S. Hallworth (Le Carnival) 3 Miss Summerley (Old English Waiting Maid). Miss Carless and Miss Gertie Jones, etc. In many of the classes the Judges had a most difficult task. The cars were splendidly got up, and the fancy costumes of the Ladies especially were so excellently produced that the mere onlooker had difficulty in picking one from another on a point of merit. It says much for the decisions that, as a whole, they were endorsed by all, and though it was an unenviable task and that took up some time, the only regret occasioned was that there were not more prizes to give to others who thoroughly deserved such consolation for all their time trouble. It is seldom, if ever, that we have seen a better selection or keener competition; the whole “pageant” was worthy much larger sphere, and genuine and honest pride was felt and expressed in the achievement. As soon as the awards had been made, the order was given for marching, and with the Committee and Judges acting as marshals, and headed by the band, the procession proceeded down to the Station gates, wheeled and returned to the starting point, where they were dismissed. The crowds that assembled lined the route and followed, was one of the largest ever seen. Visitors from neighbouring villages were plenteous and even from Luton brake loads came in to see and admire. It was a scene not easily described: the brilliant dresses, gay airs, and effective disposition of all, with the general decorations, was a picture to be seen to be appreciated, and that it was so was apparent on every hand. It was a carnival in the best sense and long will it be remembered. 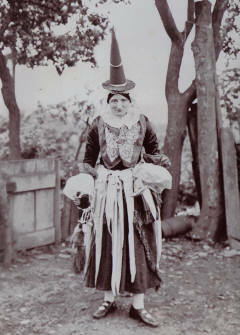 Miss Mary Page, “the Witch” was the life of the journey: her get up and antics were alike the signal for continued hilarity, and she enjoyed it as much as any, remarking “Holiday to­day, work tomorrow” a very sensible sentiment, though not literally. 100 yards flat, men over 40: 1 A. G. Ellingham 2 F. Spreckley 3 C. Byway. 100 yards flat, women over 40: 1 Mrs. Page 2 Mrs. Small 3 Mrs. Coleman. 150 yards flat, men over 30 and under 40: 1 J. H. Hickin 2 C. Mountfort, 3 A. Moore. 100 yards flat, women over 20 and under 40: 1 Mrs. Chaney 2 Mrs. Farmer 3 Mrs. Cook. 100 yards wheelbarrow (blindfold): 1 R. Neville 2 H. Harden 3 J. Clarke. 150 yards sack, men over 16:1 W. Capp 2 W. Byway 3 A. Dickens. Half-mile flat, men over 16 and under 30: 1 J. Whitlock 2 J. Clarke 3 C. Whitlock. 100 yards slow cycle men. – 1 O. Mabbutt 2 C. Whitlock 3 E. Spreckley. 150 yards scratch, men over 18: 1 W By­way.2 C. Whitlock, 3 J. Whitlock. Climbing greasy pole: C. Byway. During the above, both morning and evening, the Band discoursed a number of selections, including the march “Royal Hussars,” “Gaiety Echoes,” “Songe d’Autumne” “The Goldman” “Havana” “The Earl and Girl’ “The Ambuscade” “Flag of Truce” “The Druid’s Prayer” “The Balkan Princess” “The Choristers’ Waltz” “Our Miss Gibbs” “Midsummer Valse” “The Arcadians” “Ship Ahoy!” etc. Some of the events were very keenly contested, but the slow cycle was very slow indeed. The pillow fight was productive of much hilarity, especially when the contents of one pillow flew all over the place, and the greasy pole exhibition was also very amusing at first, but it took so long that it became wearisome. The winner only accomplished it by means of hand and foot ropes, and very few saw him get the flag, which for an hour or more had defied all comers. Taking advantage of the time thus spent, the Rev. D. W. Henry thanked all who had helped in any way to make the day a success, and his remarks were endorsed with cheers. He also distributed the prizes as far as possible and shortly after a move began towards the top of Aspley Heath for the torchlight procession. In addition to the above awards, prizes were also given for decorated and illuminated houses and shops. The houses were judged by Messrs. Toogood and Moore and the Rev. D. W. Henry, and the shops by Miss Pain, Mrs. de Mowbray and the Rev. D. W. Henry. The awards were for houses: 1 Mr. C. Mountford, 2 Mr. Dudley. Cottage: 2 Mr. Blackaby. Shops: 1 Mr. Toogood, 2 Mr. Inwood. The illuminations could not be carried out on the shops owing to the strong wind, and this was postponed until Friday. The houses stood better and were lit up, the Judges – Messrs. Moore, Collins and Mason – putting – 1 Mr. Mountfort, 2 Miss Baker (Aspley Heath). Friday gave an opportunity to the shops and the task of judging was carried out by Messrs. Mould, Swain and Mason. Their awards were: 1 Mr. McMurtrie 2 Messrs. Benskins 3 Mr. Emms. This was not all however that was done on Friday. During the morning a general desire was expressed for a repetition of the procession. Word went round and at 6.30 an even larger and on the whole better assembly was present on Aspley Hill, than the previous day. Mr. Pettit, in hunting coat, headed the cavalcade, Mr. Rice and others came up on chargers, one with blue and red hoofs and white stockings, and formed an advance guard to the band; the school children mustered in strong numbers directly after the band and scouts, and quite a long line of fancy and eccentric costumed participants were interspersed between the cars, one notable addition being a fine representation of “Dr. Grace” by Mr. Ellingham. The spectators came from all parts, and the general opinion was that a finer show had not been seen anywhere, of a similar or much larger size. After marching to the station and back to the Square, a ring was formed, and the National Anthem sung. An adjournment was then to the “sports” field for dancing, but rain began to fall and after one or two rounds, arrangements were made by Mr. Cheetham for the Institute to be used. To secure the dancers room, a charge of 3d. was made, this did not prevent a full house, though many preferred their homes, and the “trip it lightly” programme was carried on with much spirit for a considerable time the finish being quite as much enjoyed by those joining in as any part of the proceedings.